The locomotive didn’t have to possess an Alco builder’s plate to make Alco Models’ product line. From the beginning, the importer provided models of various HO-scale locomotives. This General Electric E44 electric locomotive is one of the more uncommon prototypes to be produced in brass for Alco Models. This custom-painted and weathered Pennsy E44 is credited as the work of J. William Kress of Tempe, Arizona. This time of year makes nearly every model railroad enthusiast think about trains of their youth. Pouring over “wish book” catalogs and looking at all the toys (especially model trains) was a pursuit for many young hobbyists. This year marks the 50th Anniversary of another great wish book that brass importer Alco Models launched in late 1967. The company is familiar to many seasoned modelers. 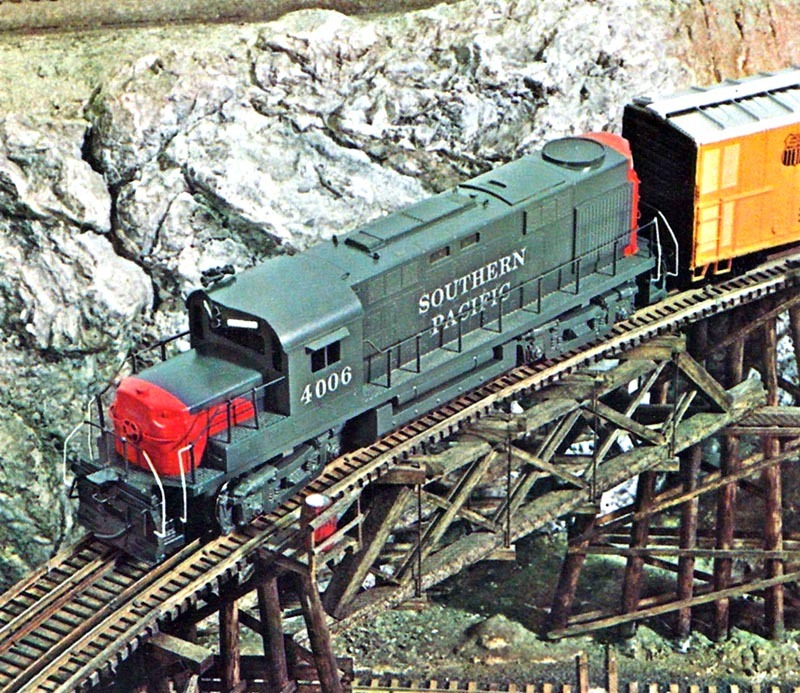 Alco Models was a mainstay in the hobby for a number of years, peaking in the late 1960s and continuing into the 1980s. That first 30-page publication, Alco Models 1st Edition Catalog, provided a glimpse at an immense number of projects. The first release, to my knowledge, from Alco Models was a brass HO-scale DL-640 diesel locomotive (#D-101, MSRP: $42.95 in 1967). Known better to hobbyists as Alco’s Century series-predecessor RS-27, this stub-nosed 2,400-hp diesel didn’t find many takers, but it remains an eye-catching prototype. Total RS-27 production topped out at a meager 27 units. 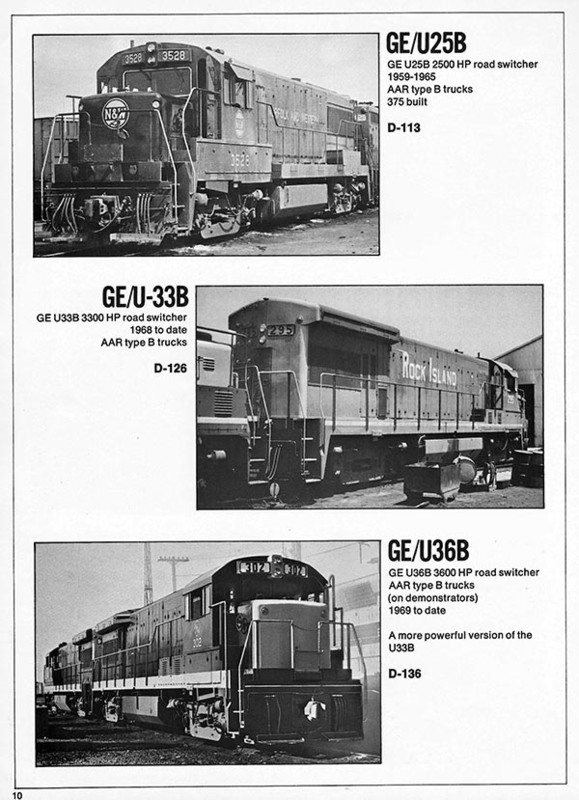 Comparing Alco’s RS-27 to Electro-Motive Division’s GP20s (260 produced) and GP30s (948 produced), as well as General Electric’s U25B (478 produced) offered during the same period (1959–1962), demonstrates that the DL-640 model wasn’t a resounding success. 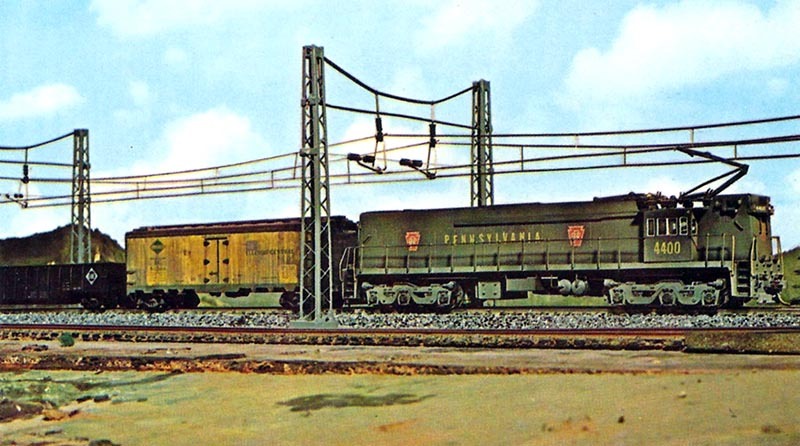 The biggest fleet, if you could call it such, was Pennsylvania Railroad’s 15 examples of RS-27s. Next came Union Pacific, taking the five demonstrators (675–678), followed by Chicago & North Western’s four RS-27s (900–903). C&NW traded in those units a few short years later on Century 425s. Two RS-27s went to Soo Line (415 and 416), and a single RS-27 worked for Green Bay & Western (310). The popularity of a prototype with railroads has never been a make-or-break factor for model selection — TYCO’s Century 430 (total Alco production of 16) choice over doing a GP40 (total EMD production 1,221) back in 1966 is a prime example. Indeed, Alco Models did import more brass Alco diesel reproductions. That 1967 debut catalog featured a Chicago & North Western RS-27 illustration, and along with that prototype, the line promotes 25 more Alco-made diesels. From the early HH-600 end-cab switcher to then-modern Century 855 behemoths, Alco Models served the Alco enthusiast well. The company’s name didn’t prohibit it from dabbling in other locomotive types. 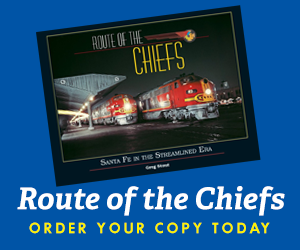 From the beginning, you’ll find Baldwin, EMD, General Electric, Lima, and Alco-relative Montreal Locomotive Works diesels, as well as a select group of electric locomotives in the company’s catalog. While seemingly ambitious, a glance through Dan Glasure’s excellent The Brass Train Guide Book (2007, Publishing Partners International) and its companion Price & Data Guide (two volumes have been published to date), Alco Models did import most of what I find listed in the company’s 1967 first catalog. 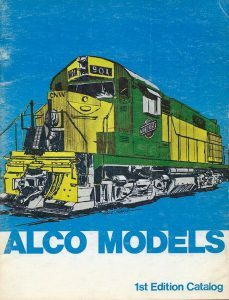 Being a hobby literature collector, I’ve looked for (but never located) another Alco Models catalog. Though touted as its “1st Edition,” it may be the importers only catalog. 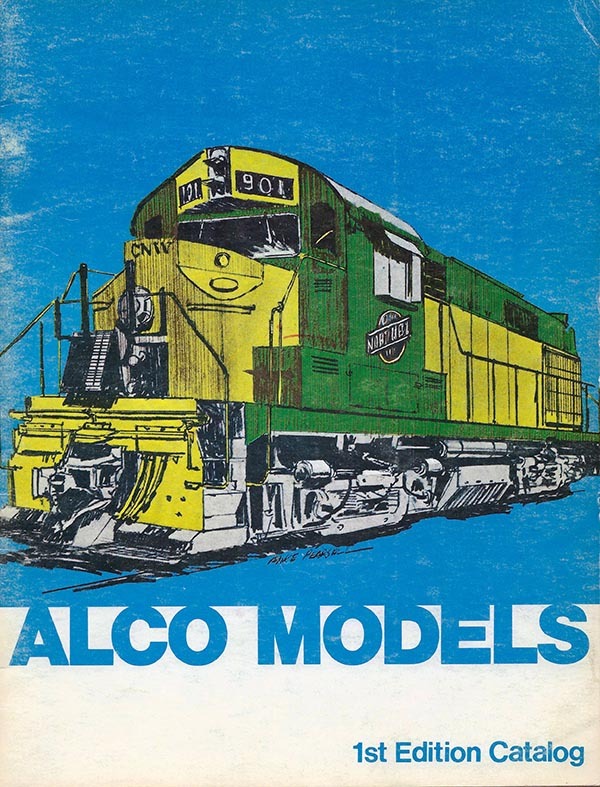 Following its arrival to the hobby a half-century ago, Alco Models ads appeared in model railroad publications with regular frequency promoting the company’s new and coming releases. These ads — a reason why you need back issues of model railroad magazines if you’re a serious collector — are the only company-provided resource that I can point out for releases from the 1970s and beyond. One of the color images included in Alco Models’ 1967 catalog shows a Southern Pacific DL-721/RS-32 diesel locomotive brass import. The catalog’s caption notes the “bloody nose” livery was the product of California Locomotive Works. Alco Models promoted in this 50-year-old catalog arrived undecorated and featured generic non-road-specific details for the most part. What I find appealing about Alco Models releases is the period in which they were imported. The late-1960s into the 1980s represents my years as a youth first pursuing model railroading, making the many Alco Models efforts nostalgic and sentimental for me. The other great thing about the company’s brass imports was the quantity brought into North America. When one thinks “brass imports,” you don’t think mass production on the level of an Athearn or Bachmann hobby manufacturer. Space is limited to get into specifics here, but there is a period in the late-1960s and into the 1970s when brass imports enjoyed some near “regular release” status to an extent with respect to quantity available. Checking production numbers included in Brass Model Trains: Price & Date Guide, Volume 2 – 2009 Edition (2009, Publishing Partners International), you see items from the years I mentioned with totals well in excess of 500 models and some as high as 1,000 copies or more produced. Examples include 600 handmade by Kumata brass SD45s (#D-130) for Alco Models’ 1969 run with Pacific Fast Mail providing another 750 Fujiyama-made SD45s in HO about two years later in 1971. (A story on Pacific Fast Mail’s brass SD45 appeared in the 1st Quarter 2017 edition of HO Collector.) The early 1970s operator/collector had a market with 1,350 brass SD45s available. Move ahead a decade to the early 1980s, and you’ll see numbers ranging from a couple hundred for larger runs to well below a hundred or less for similar models. Granted, the market also began to cater to road-specific features and thus a production run might have been split between a handful of railroad examples for that same diesel prototype, but in general, those giant import runs appear exclusive to that period noted (late-1960s to 1980). There are other contributing factors to consider, but the overall situation outlined makes for good availability at an attractive price for 21st century hobbyists. My first Alco Models acquisition came a number of years ago from Mizell’s Trains in the Denver, Colo., area. Although Mizell’s is no longer in business, I remember it was a fun place to visit. On one trip, I picked up a good quality example of Alco Models’ U25B. This unit was priced around $60, as I recall, and included a box in good condition, as well as the original printed materials. The model still had the cardboard protector sections between the handrails and the U25B’s body. Next came an Alco Models’ HO-scale SD45T-2 at the Boeing Employees Model Railroad Club swap meet in the St. Louis area. This fun swap meet is held in St. Louis’ west county area in the spring and fall. I paid $50 for a decent condition example of this Southern Pacific “tunnel motor” that included its original box. At that same show, maybe a year or two later, I picked up a Pennsy caboose from Alco Models for $20. This caboose had its box but was a badly tarnished model. With a bit of clean up by my dad, it turned out to be a nice addition to my collection. I got bit by the brass bug and bought this HO-scale brass Alco Models’ RSD-15 diesel model. With examples from Alco Models being up to 50 years old, condition varies. My interest is mainly in locating a decent-looking example that has not been modified and includes the original box. The foam provided to protect models inside their cardboard boxes is often a victim of decay and turns into a dusty mess. Deteriorating foam frequently causes irreparable damage to brass models. Inspect vintage brass models carefully. I titled this section, “Shouldn’t Have Looked,” while writing up this edition of “From the Archive.” I named it so because I did a quick eBay search, the results of which are shown in the picture of the long-nosed Alco Models’ DL-600B or RSD-15 diesel I purchased. This makes my third diesel from Alco Models and fourth model, counting the Pennsy caboose. I finally bought an Alco prototype from Alco Models! Affectionately known to railfans as “gators,” thanks to that long snout, I found an example in okay shape for around $100 with its original box. This RSD-15 was Alco Models’ release #D-102. Dan Glasure’s guide shows that 400 came originally in 1968 from Japan’s Kumata brass builder. That same D-102 stock number appears for runs from 1973, 1980, and two production efforts from 1983. The 1983 Alco Models offering shows Samhongsa of Korea as the maker. For those unfamiliar, brass production migrated from Japan to Korea around 1980. Adding to these models’ collectability is Alco Models use of a standard number system that began with #D-101 for that first RS-27 diesel model of 1967. You can start filling in numbers as you locate examples in good shape at desirable prices. 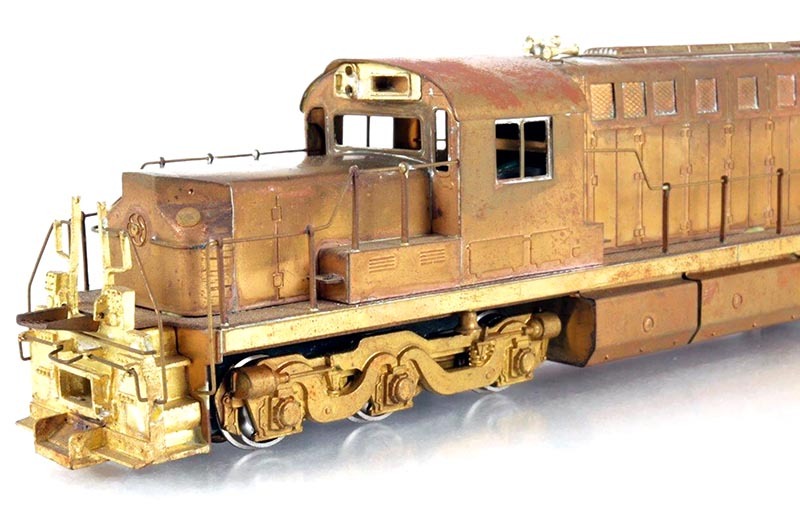 From what I know, Alco Models generally came in basic-brass with a clear-coat finish only. I find it’s fun to have brass in that undecorated gold look. It shows the detail and craftsmanship better than a model with paint and decals applied, though both are fun to own. The HO-Scale Trains Resource will soon include the return of an Alco Models section. I will have images and stock numbers to browse and enjoy. Watch for this to appear in 2018. Take a look at your next swap meet or the next time you are perusing online auctions for something in brass. I can recommend Dan Glasure’s Brass Trains as a source for information and buying brass imports. Mr. Glasure is also involved in the annual Brass Expo held in the Chicago area every fall. I hear more and more about this show and want to make it in 2018. As a kid, brass existed only in catalogs and the few samples that my dad custom painted for more well-to-do modelers. One of my favorites from that time was an HO-scale brass Santa Fe E1A diesel. I can still remember seeing that brass shell going into our Philco-Ford oven to bake its Warbonnet paint. If you’re like me, you probably owned Athearn, AHM, Bachmann, TYCO, and other makers model trains as a kid. Brass was likely beyond your allowance. Pick up a vintage brass catalog. Besides Alco Models, you’ll find many Pacific Fast Mail color catalogs, as well as publications from Hallmark Models, Sunset, Westside, and more. Those wish books just might stir interest in adding some shiny brass to your collection.